A technology company that provides services to healthcare organizations and programs needed to remain compliant with strict customer regulatory requirements to retain and monitor logs on a 24x7 basis for possible threats. After the implementing a SIEM device that was the best fit for its environment, it began the search for a managed security services provider. 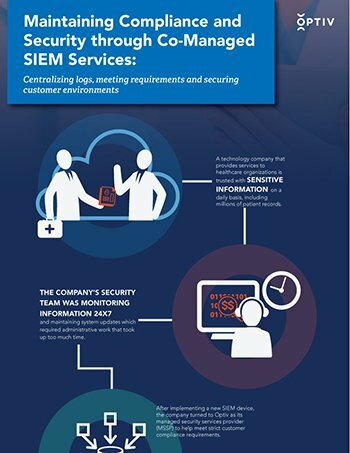 Explore how Optiv helped a healthcare IT company achieve compliance with 24x7 SIEM managed services in this infographic.